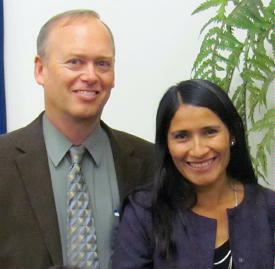 My name is Carolina Alvarado Velasco and I was a member of the United Church of God in Lima, Peru. I used to work as a Physical Education teacher. I worked at an elementary school, and also in a special government program for children with learning disability and handicap. Because of my work with handicap children, I was able to get a full scholarship for a International Coaching Course at the University of Leipzig, Germany, for 5 months in 2003. I was so happy and excited to get that amazing opportunity. Unfortunately, my financial situation would not allow me to pay $ 1,300.00 for my travel to Germany (the only cost that I was responsible for my studies). I searched for help everywhere, and finally found an option – a loan. The condition of the loan, as it is normal, was to have someone to guarantee for me. So, I went to my minister in Lima, Manuel Quijano, (the only person that I knew could fill all the requirements of my loan) and explained my situation and asking for his help. He told me that I should let him think about it and give him a couple days. After a couple days, he called me back with some great news. At that time, I did not have an idea about LifeNets but Manuel briefly explained to me about the organization and how LifeNets helps students and other individuals around the world. He told me that he wrote to LifeNets and explained my situation, and that they had an immediately answer for me – they would help me out! When he gave the money in an yellow envelope (I had never seen so much money in my hands before) and suggested that I get the ticket as soon as I could before it was too late to go. I could not believe it. Initially I thought that the organization was lending the money without interest to pay, but to my surprise, LifeNets was giving it to me for free. I felt, and still feel, most blessed for this gift. I could not even explain how I got it, because I did not write or did anything. I am so thankful for LifeNets! I studied for 5 months at the school and extended my student visa and was able to stay 6 more months. During those 6 extra months, I learned German, and did my student practice at a school that served children with special need. In 2004, I went back to my country and gave a seminar to students at my former university. During that time I continued working with handicap and children with special needs. In 2005, I married and moved to the United States. In the U.S. I had to learn English from scratch and also raised my family (twin daughters), and I did not have time enough to come back and pursue my carrier that I had loved so much but I hope to continue in this area in the future to return the blessing I had received from LifeNets. Thanks with all my heart!